Brighton is an affluent beach-side suburb of Melbourne. 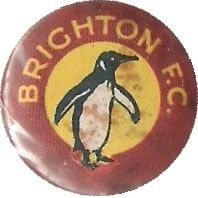 The Brighton Football Club emerged in the 1880?s. The club joined the Victorian Football Association (VFA) in 1908 and achieved moderate success over a 44-year period in the VFA. 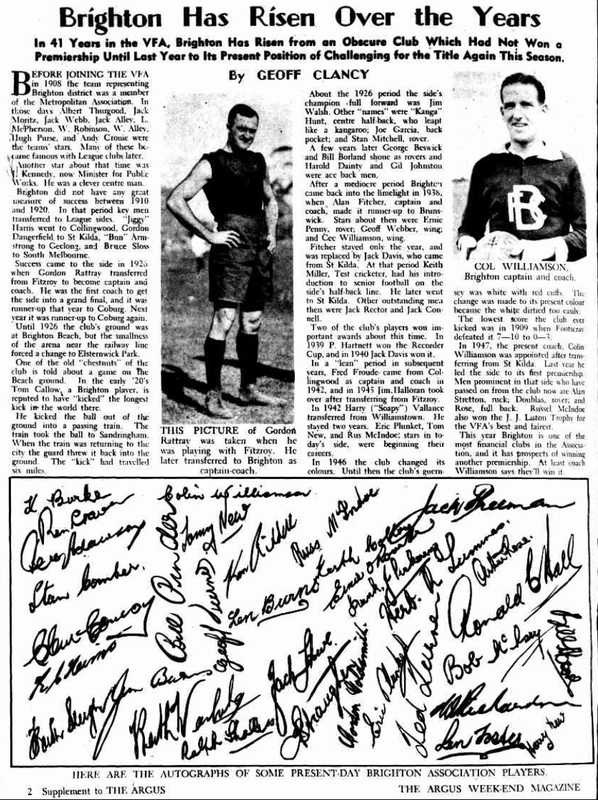 Brighton reached VFA grand finals in 1926, 1927,1938 and 1948. It won its first and only VFA premiership in 1948. Financial problems that developed in the fifties eventually led to the demise of Brighton in its traditional form. The club merged for a short period with South Caulfield (Brighton-Caulfield) before being subsumed by a new VFA identity - Caulfield. Brighton's final year as 'Brighton' was a low point in it's history. In VFA Second Division, the senior team failed to win a game, over the season scoring 761 points for and 2621 against, with a percentage of 29%. This was the lowest percentage scored by any VFA club for over fifty years and a clear sign of the need for change. Brighton changed it’s jumper colours a number of times. In 1933 they wore red jumpers with white BFC logo and a white collar. From about 1935 they changed to a white jumper with a red V, and in 1940 another version of the white jumper. Later, in 1945, they changed to a rust coloured/maroon jumper, with gold lettering. There have been two club histories written. The “Brighton Football Club Year Book – Souvenir Programme, 1950? provides a history of the club up until 1950. More recently “From Cabbage Patch to Caulfield” by Marc Fiddian was published in 2006. From Williamstown's perspective, Williamstown win a close game. Brighton have the worst conditions to train under than any team playing football in the state.